The Wall Street Journal’s recent interview with Woody Allen addresses the fact that the writer/director/actor is simply too old to make a convincing romantic lead. I thought of this interview during a crucial scene in Lorene Scafaria’s Seeking a Friend for the End of the World. In this scene, Dodge (Steve Carell) leaves Penny (Keira Knightly) as The Hollies “The Air that I Breathe” underscores what’s a difficult decision on Dodge’s part. The picture’s blossoming relationship built up to this pivotal scene, and unfortunately, it’s a deflating experience. This is due in part to the Carell’s miscasting, as his role his tailored for a younger romantic lead. This is a significant hurdle to get past, as a lot of the picture depends on a certain cloud of believability that Dodge and Penny make for a potential couple. While the picture has issues reconciling its problematic script and age disparity amongst its leads, it still surprises and manages to strike significant emotional chords. Lorene Scafaria’s handles her material with care, creating an alien world in the glimpses of chaos she provides. The apocalypse serves as a backdrop for material that delves into largely in romantic-comedy terrain. But Scafaria’s light touches, such as the darker and more cynical worldview she adopts from time to time, gives the picture unexpected gravity. It’s somewhat surprising to see so many bits of comedy come to a jarring stop when Scafaria imposes the darker backdrop into the picture. Carell has had the benefit of working with a variety of very talented actresses through the years: Catherine Keener in The 40-Year Old Virgin, Juliette Binoche in Dan in Real Life, Tina Fey in Date Night, and most recently Julianne Moore in Crazy Stupid Love. The chemistry with each individual actress has varied, but when it comes to individual performances, Keira Knightly far exceeds any of the above. I’ve never been much a fan of hers, but her elastic features work in her favor with this role (as opposed to what was seen in A Dangerous Method). What makes Carell a particularly limited performer is that so many of his films demand him to be a monotonous sad sack. As much as I admire his work on The Office, his films are only as successful as his co-stars who emote on his behalf. Knightly balances the two, coming off as genuine and heartfelt. The picture’s closing sequence, which seems to be met with a bit of criticism, registers as exceedingly effective. Marked by strong performances and Tim Orr’s best cinematography since 2007’s Snow Angels, it’s the one moment where I feel the film manages to transcend its narrative contrivances and work on purely visceral terms. The rest of the picture suffers from typical narrative pitfalls of the genre – forced relationship issues and stagnant plotting. But the film’s individual moments amount to something greater. 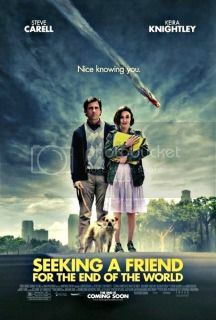 With a bit more finesse, Seeking a Friend for the End of the World could have been something exceptional. As it is, it’s surprisingly agreeable, albeit light.